St Louis is the first Route 66 town in Missouri. The most interesting parts of Route 66 there are on the western outskirts where you will find well maintained neighborhoods with older stone and brick houses that look much like they must have been in the heyday of Route 66. Just before leaving town, be sure to stop at Ted Drews Frozen Custard. It's a Route 66 classic. Once you get out of the St Louis metropolitan area, you will be treated to some of the most beautiful tree lined rides on the Mother Road. There are lots of well preserved old towns as well as several ghost towns where only remnents of Route 66 survive. On almost all of your ride you will be away from interstate hiways, and even when you are on or near them, the riding is wonderful. You will see many restored service stations and the world's largest rocking chair. You will see well preserved motels like the Munger Moss in Lebanon and the Rail Haven in Springfield. The Boot Motel in Carthage looks to be restored to its former grandour. Near Staunton, you can visit the Merrimec Caverns. While the Caverns are not right on Route 66, they arguably are the most visited attraction for Route 66 travelers. On the way to Devil's Elbow, you'll get to travel some rare concrete four lane Route 66 roadway, and when you get there, you'll find the Elbow Inn, which is one of the best biker destinations on Route 66. In Springfield, you'll be able to see many preserved Route 66 motels and restaurants, as well as the site of a fameous Wild Bill Hickok shootout. From Springfield almost to Joplin, you will pass through more than a dozen rural towns, many of which are all but gone. Halltown, Paris Springs and Spencer, although ghost towns, have some of the coolest Route 66 relics in Missouri. In Carthage, you can visit the site of the first Civil War battle between Northern and Southern ground troops. 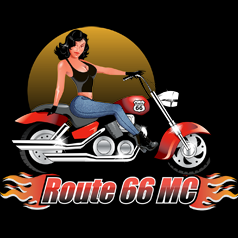 For the bikers along this streach, there is the Route 66 Tavern near Albatross and the fameous Route 66 Cafe' in Avilla, which is a must stop bar that is visited by bikers from all aove the world. At the Western end of Missouri, Joplin is rebuilding from the tornado of 2011. The destruction cannot be understood without seeing it in person. Still, much survived, and there are serious biker spots there like Hogs and Hot Rods and the Undercliff, which is built into the side of a cliff. So, enjoy Missouri. It is a great motorcycle riding state. Click here, to see the first town in Missouri, St. Louis.